There is a perennial problem of, and tension between, community sport rhetoric and elite sport policy priorities. Increasing funding for elite sport has led to greatly improved international success for GB athletes, especially at the Olympic Games yet there would appear to be a dis-connect between this upward trajectory and the ‘flat lining’ or decrease in the number of citizens deemed ‘physically active’. Despite this, there would appear to be an unshakable belief among policy-makers in the ability of elite sport policy (elite sport development and sports mega-events) to deliver participation objectives. With reference to the UK Government’s most recent sport policy document (December, 2015), ‘Sporting Future. A New Strategy for an Active Nation’, this keynote presentation will examine how this strategy might help overcome this perennial problem? 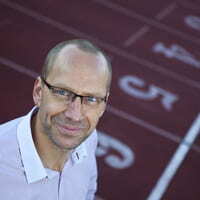 Jonathan Grix is a Professor at Manchester Metropolitan University He has published over 50 peer reviewed articles in the area of sport policy and politics. His latest sport monographs include Sport under Communism. Behind the East German “Miracle” (co-authored with Mike Dennis) (Palgrave, 2012) and Sport Politics: An Introduction (Palgrave, 2016). Jonathan is the Editor-in-Chief of the International Journal of Sport Policy and Politics published by Taylor and Francis.